All business, industry and communities share legal and social responsibilities to promote and protect human health and the environment. We do this by safely, responsibly and efficiently managing and reducing waste, maximising waste reuse, recycling, and finding opportunities to generate resources. As a large organisation, we deal with staff, student, visitor and supplier waste. This means CSU contends with a host of operational waste issues, not least the increasing costs of disposal charges and landfill taxes, but also the possible future requirement to measure and report scope 3 carbon emissions relating to waste through the National Greenhouse and Reporting Scheme (NGERS) . There are increasingly stringent legal requirements for handling and disposing of our waste safely and efficiently. By meeting these requirements, CSU avoids enforcement action, but may also cut costs or save money. Many legislative requirements apply to all institutional waste, while some apply only to specific types of waste. sourcing revenue by reusing or recycling. This framework was benchmarked on 27 August 2015. One of the changes that has occurred at the Albury-Wodonga campus was the installation of hydration stations where people can refill their water bottles. There have also been changes in attitudes around landscaping with introduced species to drought tolerant locally endemic species. Also, water sensitive designs have been incorporated including using many smooth boulders to attract moisture for the plants. The most significant change over the last 12 months is the scrap metal skip bin. This simple change has resulted in a large impact. We now save a lot of materials going into land fill and have shifted our mental waste culture. Before the attitude to waste management was to either ‘burn it or bury it’. We certainly did not sort our waste and put different materials into different bins. 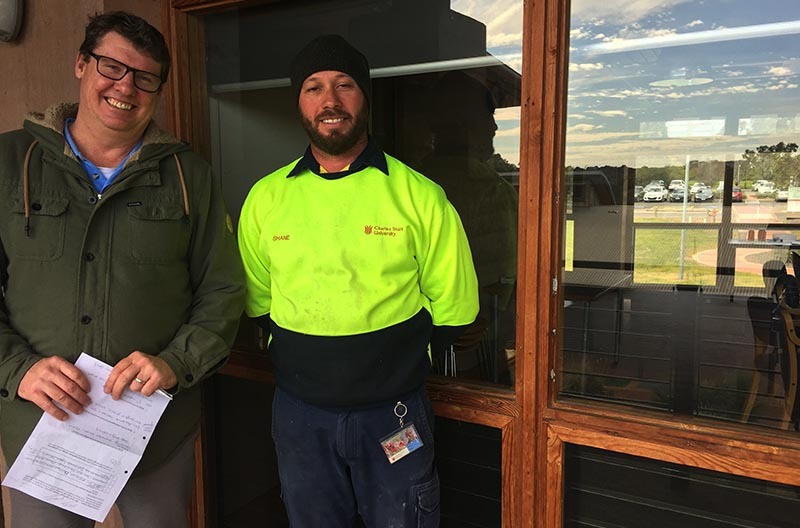 General Assistant Maintenance Officer Shane Wilson took the initiative to improve recycling as a result of different educational campaigns on the Albury-Wodonga campus over the last five years. One example is that we took 24 boardroom office chairs and pulled them apart and recycled the metal bases. Now there is an ongoing program of collecting scrap metal in our skip bin. It is removed by a waste contractor for a minimal fee and it is often removed from campus free of charge by scrap metal collectors who forward sell it or use it for scrap metal. By Richard Overall, DFM 9 August 2016. By Ben Moore, DFM, Dubbo in November 2015.